Illinois freshman Giorgi Bezhanishvili slams home two points during Illinois' 79-74 win over #9 Michigan State Tuesday night in Champaign. 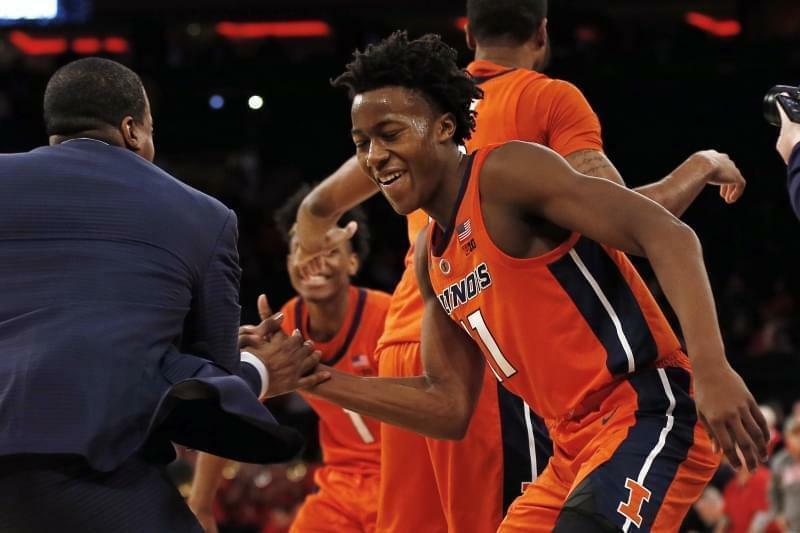 Ayo Dosunmu hit back-to-back three-pointers, breaking a tie game with two-and-a-half minutes to go, sending the Illini men to a 79-74 win over #9 Michigan State Tuesday night in Champaign. Dosunmu scored a game-high 24 points. 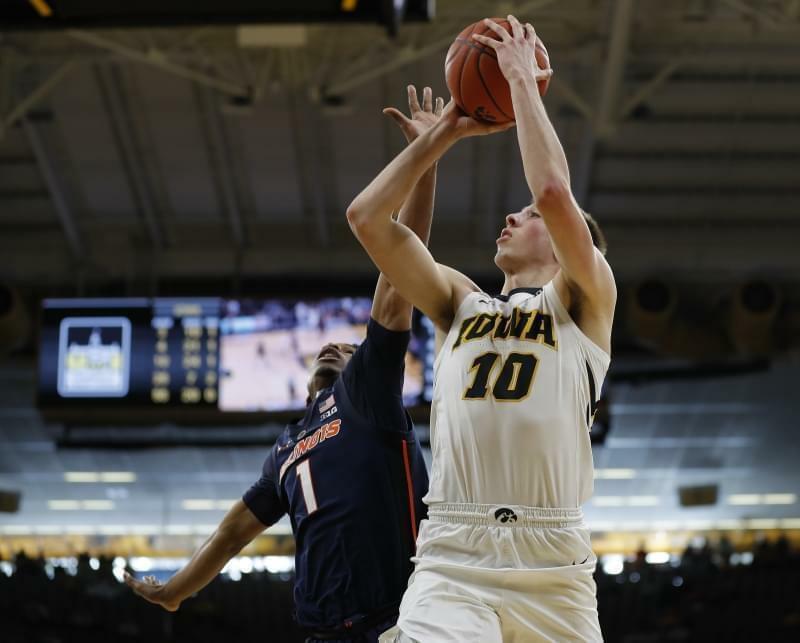 He expressed satisfaction about his team's focus in avoiding a letdown after Saturday's win over Nebraska. Dosunmu's fear was not unfounded. Illinois controlled the first 30 minutes of the game, but the Spartans regrouped for a 22-5 run, eliminating a 14-point Illinois advantage, and taking their first lead with 6:21 remaining. 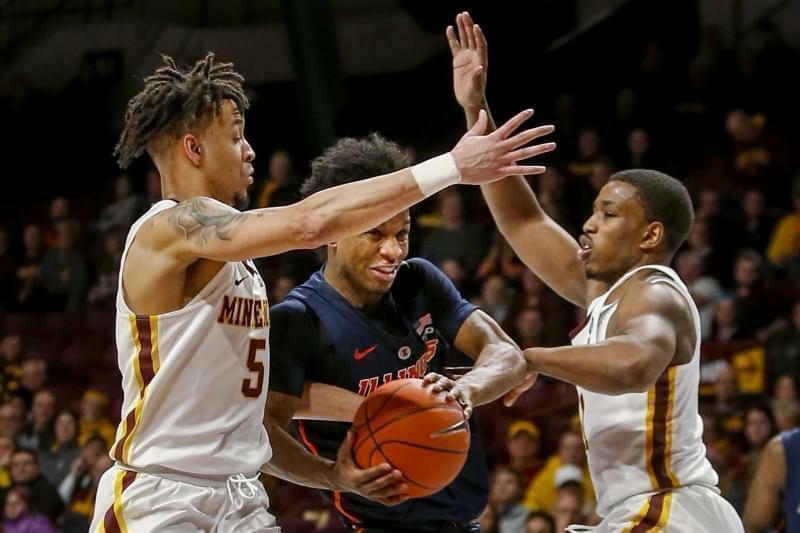 Illini head coach Brad Underwood didn't say he was disappointed with his team's finish, but he did emphasize that the first half was the good half. "I thought tonight the first half, defensively, was as good as any team I've coached." Underwood said. "Obviously, you force a team like Michigan State into 17 (first half) turnovers, you're going to feel good." Overall, the Spartans coughed the ball up 24 times, matching a season-high number of gaffes. 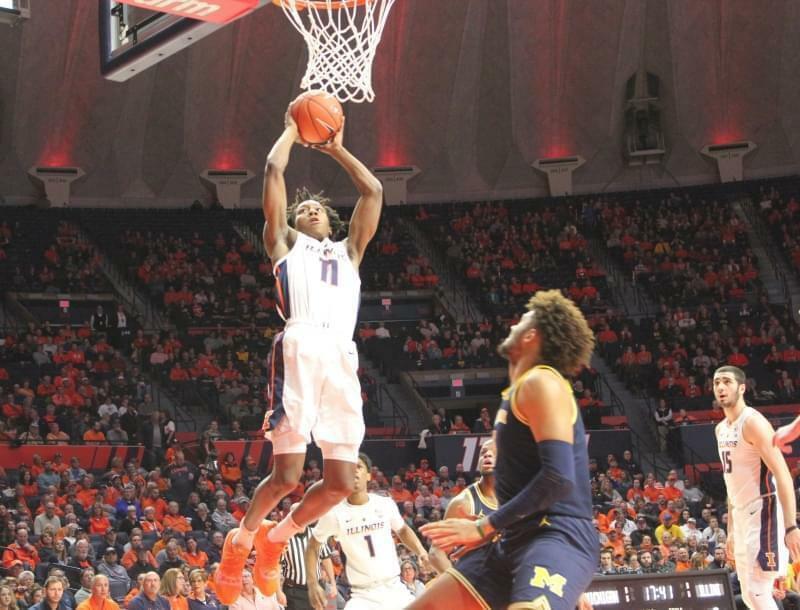 Twelve of those turnovers were Illini steals, including three apiece from Dosunmu and Trent Frazier, who also scored 15 points. Spartan point guard Cassius Winston, a pre-season candidate for Big Ten Player of the Year, committed a personal record nine turnovers, seven in the first period. 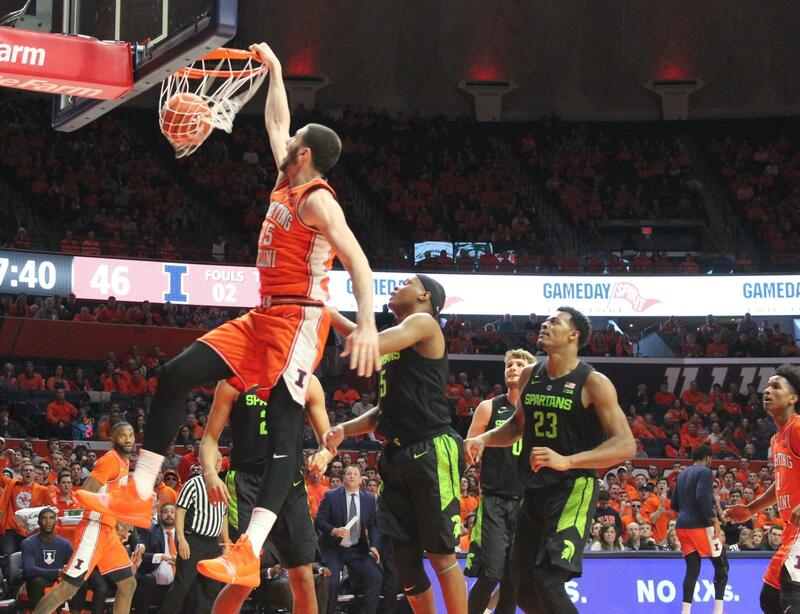 Giorgi Bezhanishvili scored 16 for the Illini, and grabbed a team-high five rebounds. 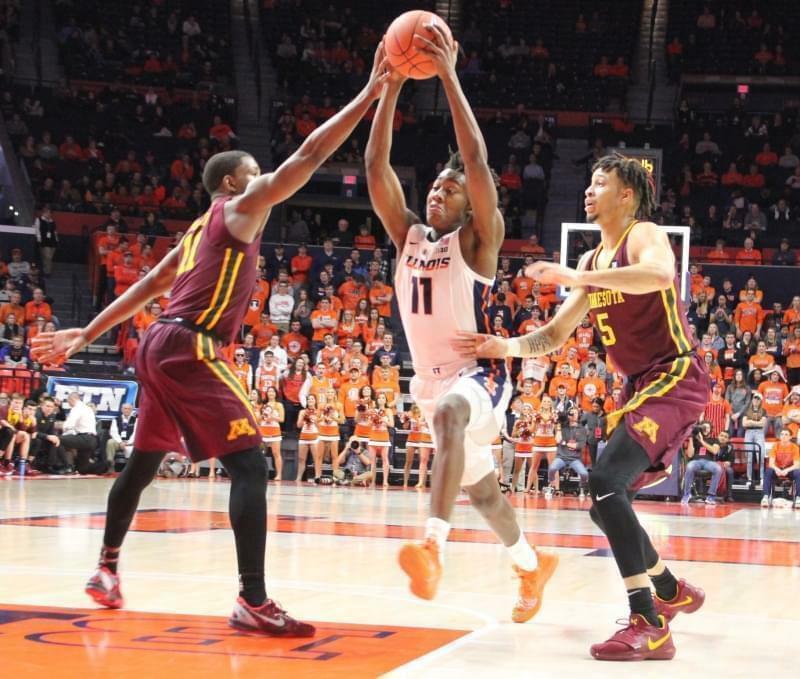 Andres Feliz added ten points for Illinois. Winston led the Spartans with 21 points. Kyle Ahrens and Kenny Goins each tallied 11. Xavier Tillman scored a career-high 16 points and grabbed eight rebounds in the first start of his career. Michigan State won the battle of the boards by a 30-25 tally. Both teams performed well at the free-throw line, after shooting terribly in their respective previous games. MSU converted 23-25 on Tuesday. Illinois made 18-22. The loss is Michigan State's third in a row, and third in Big Ten play. The Spartans are now 9-3 in conference, and 18-5 overall. Illinois improves to 4-8 in the Big Ten, 8-15 for the season. 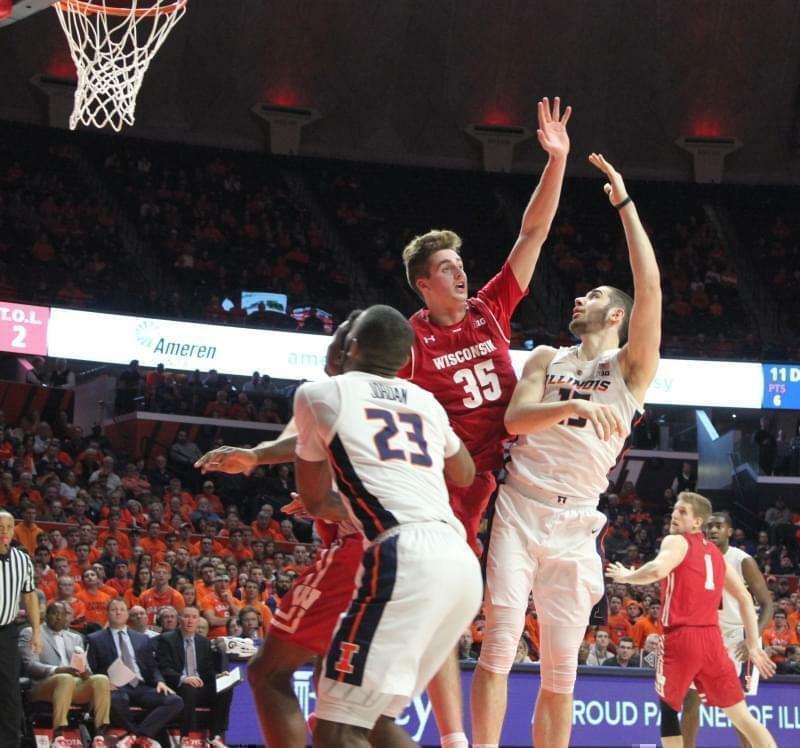 The Illini return to action when Rutgers visits the State Farm Center on Saturday at 3 pm.